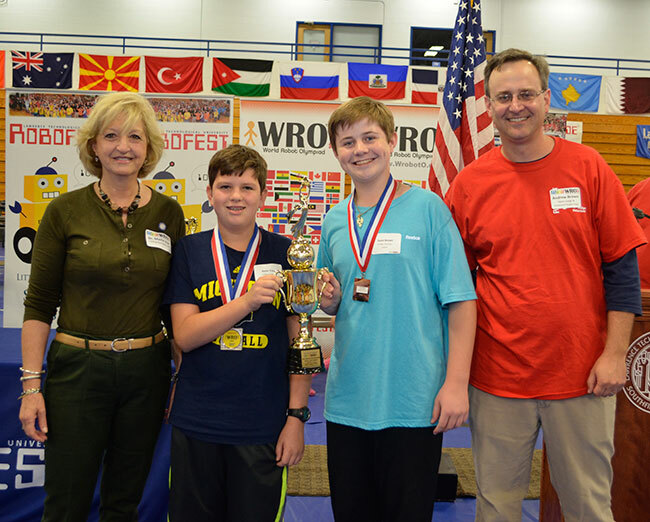 SOUTHFIELD, Mich. – The national championships of the World Robot Olympiad were held at Lawrence Technological University on Sept. 19, and three of the eight teams that won the right to represent their country in international competition are from Northville and Canton. Jason Brown and Kevin Tracz (Pi-Rho-Technics) of Northville, who took first place in the Regular Junior category. Brian Ding and Justin Chang of Northville and Eric Liu of Canton (RoboExplorers) who took first place in the Open Category. Charles Liu of Canton and Christopher Geng and James Kevin Xue of Northville (Robofest team), who took first place in the Regular University category, even though they are still high school students. WRO started in Singapore in 2004, although the United States only began participating in 2014. Some 20,000 elementary, middle school, high school and university teams from more than 50 countries began competing last spring by building and programming autonomous robots to perform specific tasks. Eighty-eight teams from nine states competed in the state qualifiers in the United States, and 43 teams advanced to the national finals. Eight teams from California, Illinois, Michigan, New Jersey and New York have now qualified to compete in the WRO international finals. For the second year in a row, the WRO-USA national organizer has been Professor CJ Chung of Lawrence Technological University. Chung, who teaches computer science, was selected to lead WRO-USA last year because of his leadership role in LTU’s Robofest competition, which also makes it fun for students to learn important principles of the STEM subjects: science, technology, engineering and math. WRO General Secretary Claus Ditlev Christensen of Denmark attended the event and spoke at the opening ceremony of the WRO-USA finals. More results and information about the WRO-USA national championships can be found at www.wroboto.us. LTU Provost Maria Vaz (left) congratulates Kevin Tracz (second from left) and Jason Brown of the Pi-Rho-Technics team for winning the Regular Junior category at the World Robot Olympiad national finals held at Lawrence Tech on Sept. 19. At right is coach Andrew Brown. 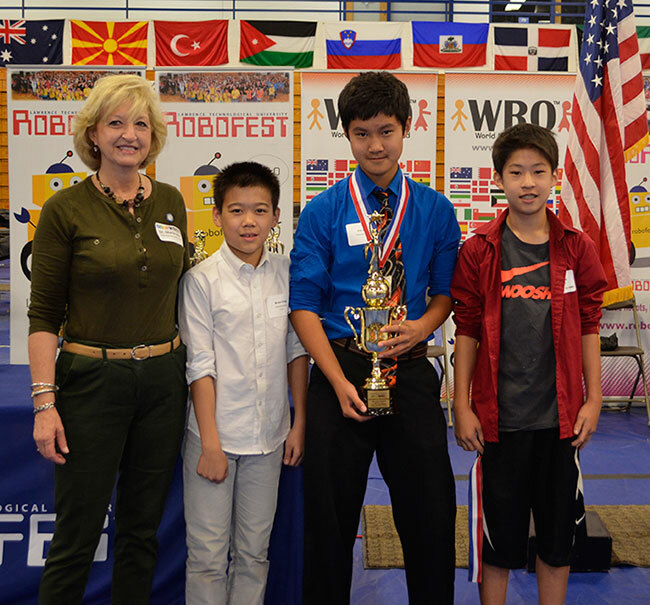 LTU Provost Maria Vaz (left) congratulates Brian Ding, Eric Liu and Justin Chang of the RoboExplorers team for finishing first in the Open category at the national finals of the World Robot Olympiad. LTU Provost Maria Vaz congratulates (from left), Christopher Geng, James Kevin Xue and Charles Liu of the Robofest team for winning the Regular University category at the national finals of the World Robot Olympiad.